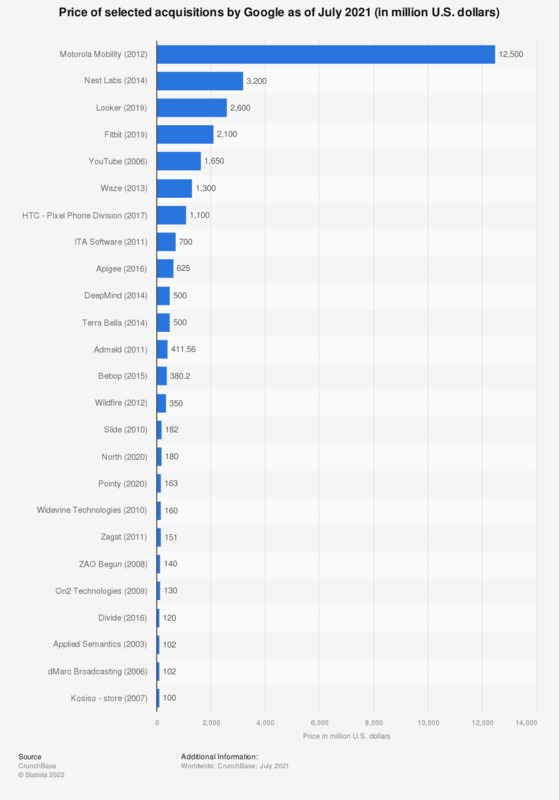 This statistic shows a selection of companies Google, Inc. has acquired since 2003, and their respective price. In June 2013, Google acquired social traffic app Waze for 1.1 billion U.S. dollars. The internet company's most expensive acquisition was Motorola Mobility in August 2011, tallying 12.5 billion U.S. dollars. *Admeld was purchased for 400 million Canadian dollars. **Part of HTC's mobile division was purchased in September 2017 for 1.1 billion U.S. dollars.